For most of his career Georg Philipp Telemann worked as Musikdirektor in Hamburg. It was a centre of the Enlightenment in Germany, and there can be little doubt that Telemann felt at home there. He was open to modern fashions, not only in musical matters, but also spiritually. His activities and his compositional oeuvre bear the traces of the influence of the Enlightenment. Part of this movement was the wish to educate the people. That certainly was one of the reasons Telemann composed so much music which was challenging but not too difficult for musical amateurs. Another of the ways to educate the people was the publication of periodicals. Telemann followed this example with Der getreue Music-Meister which appeared in 1728/29. Composers of the mid-18th century often also stood in close contact to the main poets of their time. The connections between Carl Philipp Emanuel Bach - Telemann's godson who was to succeed him after his death - and a circle of poets in Berlin, when he was still in the service of Frederick the Great, are well documented. In comparison Telemann's connections to poets is less well known, probably with the exception of Barthold Heinrich Brockes (1680-1747), whose Passion he set to music. The present disc includes music on texts by Friedrich Gottlieb Klopstock, in particular parts of his long poem Der Messias of 1759. Klopstock was born in Quedlinburg, a town southwest of Magdeburg, and received an outstanding education. It was during his formative years that he made early drafts of what was to become his most famous work, Der Messias. The first cantos were written in 1745 when he studied theology in Jena; they were published the next year, after he had moved to Leipzig to continue his studies. In 1751 he received an invitation from Frederick V of Denmark to settle in Copenhagen. Along the way he visited Hamburg where he met Margareta Moller whom he married in 1754. It seems likely that during this visit he came to know Telemann. Another visit to Hamburg is documented in1759. He also met several people who are known to have belonged to Telemann's circle of friends. For his poem Der Messias he relied on the Bible - the Gospels, the Acts of the Apostles and the Revelation of St John - and was inspired by the Paradise Lost of John Milton. The theme is the redemption of mankind and the poem starts with Jesus's entry into Jerusalem on Palm Sunday. The poem as a whole is contemplation rather than description. The complete poem comprises twenty cantos of almost 20,000 lines, all written in hexameters. The latter caused the composers whom he invited to set parts of his poem, considerable trouble. Ralph-Jürgen Reipsch, in his liner-notes, states: "Klopstock sought the ideal of vocal music in antiquity, where, in the opinion of the time, language and music were inextricably linked in their metrical and melic elements. The uncompromising transfer of this ideal, which was also informed by Klopstock's own ideas, to contemporary music could however hardly be implemented, for music has to obey other rules than does poetry. For the composers, setting Klopstock's complicated language, which was artfully fashioned in hexameters, to music in such a manner that the harmony of the poetry remained intact, continued to be problematic." Telemann, who composed extracts from Der Messias in 1759, was quite original in his approach to this text. Arias and choruses were hardly suitable; instead he switched between (accompanied) recitative and ariosos, alternated with song-like episodes. These are not clearly separated but often follow each other attacca. At several moments Telemann inserted a short instrumental piece. The text is always in the centre and it is notable that Telemann largely avoids some of the features of his cantatas, such as word repetition and ornamentation. Musical figures as well as harmony are used for expressive purposes, and the instruments also play their part in the depiction of the text. The instrumental scoring of the first canto is for two transverse flutes, two oboes, strings and bc. In the tenth canto Telemann adds an oboe d'amore, two bassoons and a violin which has a concertante role. Telemann set parts of two cantos: verses 1 to 41 from the first (‘Sing, unsterbliche Seele’) and the verses 472 to 515 from the tenth (‘Mirjams, und deine Wehmut, Debora’). The latter, about two characters from the Old Testament witnessing the Saviour dying at the cross, is the most dramatic. The latter, especially was very well received very and compared to Pergolesi's setting of the Stabat mater. 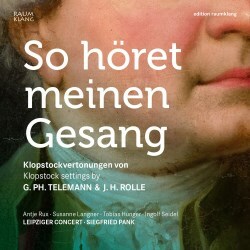 Although this disc is devoted to music on texts by Klopstock, the contribution of the poet to Telemann's cantata for Whitsunday, ‘Komm, Geist des Herren’, is rather limited. The author of the text of the cantata is not known; Klopstock is responsible only for the text of the three stanzas of the chorale, ‘Komm, heiliger Geist, Herre Gott’. The very fact that this traditional hymn received a new text caused considerable controversy. Although Hamburg was a centre of the Enlightenment, many pastors were rather orthodox, and had problems with the use of a new text. The textbooks suggest that this cantata was performed with different hymn texts in the five churches in Hamburg in 1759: sometimes the original text was used, and sometimes Klopstock's parody. It is this version which has been recorded here; in the booklet the original text has been printed in a different font. Telemann must have liked this cantata, as he performed it again in 1764. Its texture is a little unusual. It begins with an aria for bass which asks for the coming of the Holy Spirit: "Come, Spirit of the Lord, come down to us here too". It is followed by a chorale and a (recitativo) accompagnato, which refers to the disciples looking up in despair to heaven, where Jesus has disappeared (Ascension). Rather unusual for the time is the fourth section, the dictum, which quotes two verses from St Paul's letter to the Romans. The next sections, two recitatives, an aria, a duet and two stanzas of the chorale are about the consolation and support which the faithful receive from the Holy Spirit. It is in particular the orchestra which Telemann uses to illustrate single words and phrases in the text, for instance in the third section, the accompagnato already mentioned, on words like "ein mächtig Brausen" (a wild wind), "Säuseln" (murmuring) and the phrase "Es tobte wider sie ein Haufe wilder Feinde" (a mob of wild enemies raged against them). The arias are da capo, as in Telemann's oratorios from the same period. The disc ends with a piece from the pen of Johann Heinrich Rolle. Like Klopstock, he was born in Quedlinburg, as the son of the town music director. In 1721 the family moved to Magdeburg where Rolle's father became Kantor of the Old Town Latin School which Johann Heinrich was also to attend. In 1737 he went to Leipzig to study law and it is assumed that at this time he participated in performances of Bach's Collegium Musicum. By 1741 he entered the court orchestra of Frederick the Great in Berlin as a violinist. This brought him into contact with some of the major composers of the time, such as Carl Philipp Emanuel Bach and the brothers Graun and Benda. This elegy is set for two solo voices - soprano (Jonathan) and tenor (David) - with an orchestra of two transverse flutes, two oboes, strings and basso continuo. Again the text is mostly in hexameters. Rolle's approach to this text is largely comparable to Telemann's setting of parts of Der Messias, although he was not able to completely avoid repetitions or melismas, things Klopstock preferred to be omitted. The result is a compelling piece in which the feelings of the two protagonists come off incisively. This piece by Rolle is probably recorded here for the first time. The two works by Telemann are already available on disc: Ludger Rémy recorded both of them for CPO. However, there is no reason to regret that they are available in another recording, as good as Rémy's performances are. The present recording is also outstanding: four fine soloists who deal very well with their respective parts which require a strong sensitivity towards the text and an almost theatrical feeling in order to do justice to the specific character of Telemann's Der Messias and Rolle's elegy. The voices also blend perfectly which is particularly important in the hymns in Telemann's cantata, as these are performances with one voice per part; no choir is involved which seems in line with common practice in Hamburg. This disc deserves much attention considering the character and quality of the repertoire as well as the levels of performance. It is regrettable that the booklet omits translations of the lyrics.